BRAND NEW AND FACTORY SEALED AND IN IT'S ORIGINAL BOX. REPLACE YOUR BROKEN OR LOST NINTENDO 64 CONTROLLER WITH THE CIRKA N64 WIRED CONTROLLER. BUILT WITH FUNCTIONALITY IN MIND, THE CIRKA N64 WIRED CONTROLLER GIVES YOU THE EDGE . GET ONE AS A SECOND CONTROLLER,OR AS A REPLACEMENT CONTROLLER FOR YOUR N64. DESIGNEDFOR COMFORT AND EXTENDED PLAY MENORY CARD/RUMBLE PACK SLOT SHIPS IN 1 BUSINESS DAY FROM CALIFORNIA BY A US SELLER FAST STANDARD SHIPPING. AFFORDABLE EXPEDITED SHIPPING AVAILABLE. BRAND NEW AND FACTORY SEALED AND IN IT'S ORIGINAL BOX. REPLACE YOUR BROKEN OR LOST NINTENDO 64 CONTROLLER WITH THE CIRKA N64 WIRED CONTROLLER. BUILT WITH FUNCTIONALITY IN MIND, THE CIRKA N64 WIRED CONTROLLER GIVES YOU THE EDGE . GET ONE AS A SECOND CONTROLLER,OR AS A REPLACEMENT CONTROLLER FOR YOUR N64. DESIGNEDFOR COMFORT AND EXTENDED PLAY MEMORY CARD/RUMBLE PACK SLOT SHIPS IN 1 BUSINESS DAY FROM CALIFORNIA BY A US SELLER FAST STANDARD SHIPPING. AFFORDABLE EXPEDITED SHIPPING AVAILABLE. 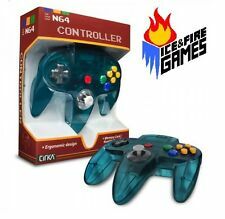 eBay Nintendo 64 CONTROLLER TURQUOISE N64 *OLD SKOOL* New In Box!! NEW FOUR N64 6 Foot Extension Cable Cords for Nintendo 64 Controller Control Pad 100% Brand New Qty: 4pcs Moms always say not to sit too close to the TV, so plug one end of this 6-foot-long cable into your Nintendo 64 console and the other into your controller; the difference may mean playing in style from the comfort of your couch rather than sitting on the cold, hard floor. extension cable for Nintendo 64 gives you more freedom with an extra 6 feet of controller cord. Plugs in between your controller and N64 system. Compatible with all wired Nintendo 64 controllers.